Quest Manly provides the best accommodation Manly has to offer. 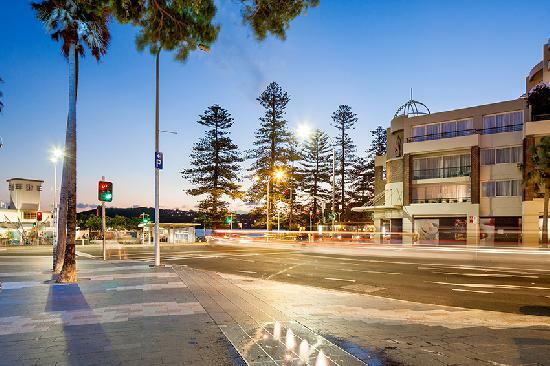 The 4 star self contained accommodation apartments are perfectly located in the picturesque seaside suburb of Manly, opposite Manly Ferry Wharf and only a short stroll from the door to the local restaurants, shops and world-renowned Manly Surf Beach. The Sydney CBD is only a 30 minute ferry trip from Manly Wharf. The location makes it easy for both the corporate and leisure traveler to enjoy the wonders of Sydney and the surrounding areas. All types of travellers can take advantage of the discount accommodation at the Quest Manly, as well as the range of modern amenities including conference centre, direct internet access, disabled facilities, faxing facilities, free car parking, guest laundry, gym & fitness equipment, lift, sauna, secretarial services, tour desk, 24 hour reception and daily housekeeping. Further Quest facilities include valet laundry service, valet dry-cleaning service, pantry shopping service, secretarial service, photocopying service, faxing facilities, baby sitting service, tour desk, concierge services, photocopy service, lift/elevator, 24-hr front desk, FREE car parking, daily newspapers, conference/meeting facilities, luggage storage, gym/fitness room and sauna. Nearby Attractions : In the heart of Manly Sydney's best ocean resort there is access to some of Sydney's most spectacular beaches, leisure playgrounds and scenic walks. A wealth of restaurants and ocean-side cafes, across the road from Oceanworld and Manly Gallery. Enjoy the endless activities Manly has to offer such as Learning to Sail, Dive, Surf, Roller Blade, Parasail, Taking a Boat Cruise, Hiring a Kayak, Renting a Skate Board, a Surf Board, Push Bike or Roller Blades, Taking the kids to Oceanworld, Manly Library, Manly Art Gallery & Museum, Quarantine Station, North Fort, Walking from Manly to Spit Bridge, the Shelley Beach Walkway, North Head, Taking the Manly Explorer Bus for a 90 minute ride to outstanding views around Manly or Shark Dives at Manly Ocean World. 1 Bedroom Apartment : Sleeps up to 4 guests on 1 King Bed & 1 Double Sofa Bed. 1 Bedroom King Apartment : Sleeps up to 4 guests on 1 King Bed & 1 Double Sofa Bed. 2 Bedroom 2 Bathroom Apartment : Sleeps up to 6 guests on 1 King Bed & 2 Single Beds & Double Sofa Bed. King Studio Apartment : Sleeps up to 3 guests on 1 Queen Bed & 1 Single Sofa Bed. Studio Apartment : Sleeps up to 3 guests on 1 Queen Bed & 1 Single Sofa Bed.